We are a group of Ladies (along with our fellas) who take Halloween, and other costuming events very seriously. 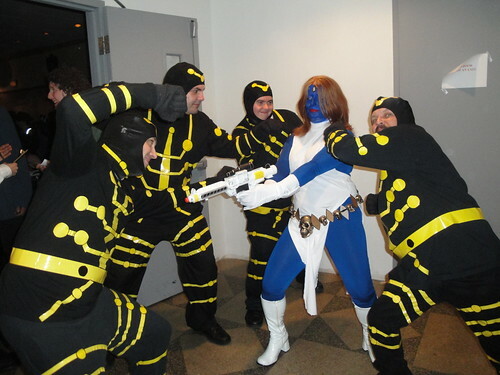 In fact, Halloween costumes are often kept under wraps because we enjoy "the big reveal" so much! But today is Halloween and the perfect day to share this year's work with the world....plus, we already went to the big Comicazi Halloweeniversary party held on October 20th, so the cat's pretty much out of the bag, and down the street at this point. TD: I will say this year was a banner year for costumes. In fact, The Goog spent MONTHS creating the signature helmet for his Ant-Man costume. 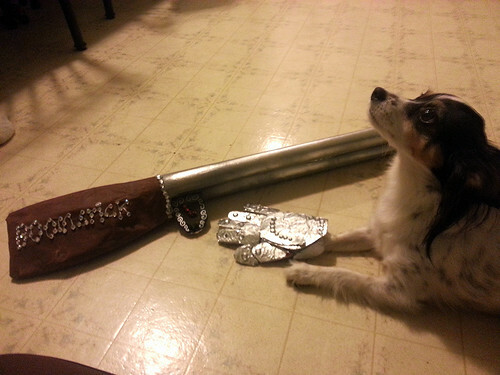 Check out this post over at his blog Copious Collections in which he discusses the process in a post titled Cosplay, Crafting and Insects, (Oh my!). The Goog and I often start thinking about costumes in June or July- often because they take planning, but mostly because that's just the kind of people we are. Ideas are tossed around, abandoned, picked up again...you might say the Halloweeniversary is the social event of the season. We plan for it like movie stars plan for the Oscars (thanks to spandex there is often some dieting involved). I, Tiny Doom, decided to make my size work for me this year, and it was my decision to be The Wasp, that inspired The Goog to try out Ant-Man. 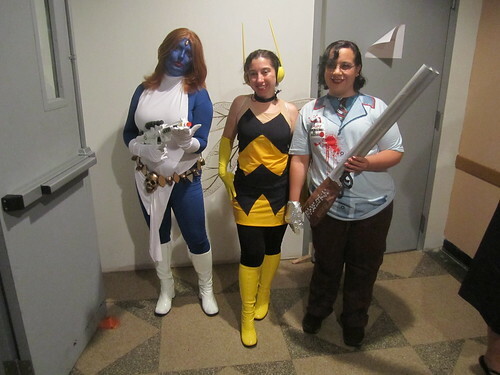 One nice thing about The Wasp is that she has numerous costume options...of varying coverage and comfort levels. 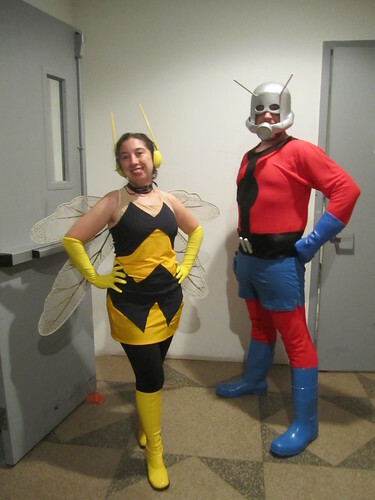 I went with what I think is the cutest and the most comfortable, The Wasp from the animated series, Avengers: Earth's Mightiest Heroes. Now I can't sew, but luckily thanks to Etsy, I found someone who could...and who makes themed running outfits. Coincidentally, a week after the Comicazi party, I ran in a superhero themed 5K. Two events, one costume! Check out This Princess Runs, she is amazing and was able to make me an awesome costume just from a picture (complete with removable glitter cape since I was not going to run with those wings on). Also, thanks to those wings, I am still finding glitter everywhere. Those boots made me about 2 inches taller...woo! I am sure it was thanks to The Goog's hard work on his helmet, we won best overall costumes at the party this year! And believe me the competition was fierce (as you will see below). Smalerie: Wow, I must admit that it is pretty tough to follow the costume champions, but at least I can talk a little bit about my approach this year. With a new job on the horizon and working extra hours to wrap up things at my old job, I admit that my planning did not start as early as I would have liked. Adding to the time crunch was how stalled I was when it came to even thinking of what I should be. Thankfully, thanks to some great conversation with a friend and a VERY large cup of tea, I was able to finally settle on being a female version of Ash from Army of Darkness (part 3 of the Evil Dead Series). Lord Smalerie (also known as The Boy in my other blog) LOVES the Evil Dead movies and after years of waiting, was finally able to wear his Evil Ash costume. While I like the movies myself, I wasn't entirely clear on what my options were as a lady other than Sheila or Evil Sheila. This is when a good friend reminded me of Rule 63. According to this internet rule, for every male character there is a female version of that character floating around out there somewhere. Things only got easier when Lord Smalerie was able to find me this t-shirt. Visions of a pretty bedazzled boom stick began to dance in my head and there you have it. 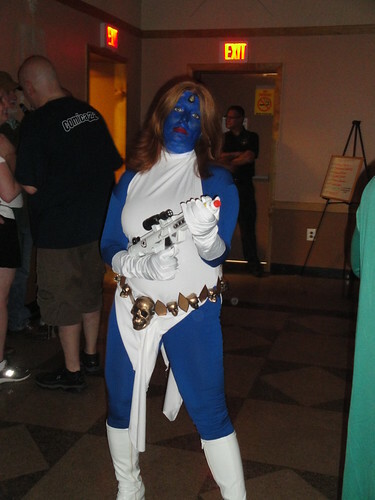 Yep, it's everyone's favorite shape-shifter, Mystique! He's Jaime Madrox, the Multiple Man! Or at least, he's ONE of him. More duct tape wizardry in action! And here we are, the first view of all the Ladies....or our Halloween alter egos for this evening.